Remember these guys? I started wargaming with these little guys a long time ago! We painted up a few battalions of French and British infantry, used paper for roads and blocks of wood for hills. 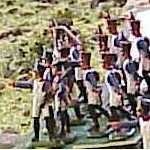 I remember being daunted by the hussar uniforms, so we just used unpainted figs to represent cavalry and artillery. We used the now classic rules in Bruce Quarrie's Napoleonic Wargaming (Airfix Magazine Guide no.4). It was really basic, but great fun nevertheless. That first game 24 years ago started a lifelong passion for miniature wargaming. There are many manufacturers in the market making figures in all the popular scales - 6mm, 10mm, 15mm, 20mm and 25mm. for those who want to use metal figures, there are a few British companies making 20mm metal Napoleonics. However, there are also disadvantages to using 20mm figures. 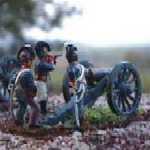 A lot of Napoleonic wargamers in the UK and the US started with 15mm and 25mm figures. There is therefore a large following of wargamers using these 2 scales. If you have a 20mm army, you may find yourself an outcast if you intend to play in the US or UK. On the bright side though, I have made contact with several wargamers in both the US and UK who think that 20mm is the scale of the future. The bottom line: If you want to be totally sure that you'll be able to play wherever you are in the world, I suggest that you raise a 15mm army - this seems to be the most popular scale worldwide. However, if you just want to play in Singapore, 20mm is a safe bet (you can play with us at least!). Also, 20mm plastic figs are easy to come by in Singapore hobby shops. There are too many figure manufacturers out there for me to list! Also, I am familiar only with the 20mm range of figures. Please note that the choices I have made are based on my own personal taste. You may have different preferences.